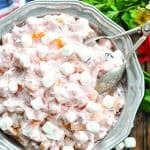 The perfect easy side dish, this Cranberry Fluff Salad combines seasonal fruits, Cool Whip, and festive marshmallows for an 5-minute recipe that your friends and family will love! How long does Cranberry Fluff last? I find that the salad is best when served within a few hours of preparation. If you want to prepare it a day in advance, just be sure to give everything a good stir right before serving. The fruit releases some juices as it sits, so while the cranberry salad still tastes delicious on Day 3 or Day 4, it tends to get a bit watery and doesn't have as much "fluff" to it. Make sure that the pineapple and the oranges are very well drained before adding them to the bowl. If you have excess fruit juice in your salad, it will be a bit watery and not as fluffy! Gently fold in the Cool Whip, being careful not to stir too hard. You want to keep as much of the air or "fluff" in the Cool Whip as possible, and you don't want to damage the structure of the fruit in the salad. If you want the pecans to stay crunchy, add them at the very end -- just before serving. The salad is best when served within 1-3 hours of preparation; however, it can be made up to 24 hours in advance.